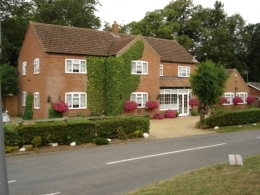 Sycamore House Bed and Breakfast is situated in the centre of Little Cressingham in the heart of Breckland, directly on the Peddars Way. Surrounded by natural beauty, Little Cressingham is close to several market towns and to the city of Norwich, one England's finest cities. Little Cressingham is an ideal first resting post for walkers on the historic Peddars Way National Trail as we are about 14 miles northwest from the start of the trail. Transport is available to and from the local town and villages where a wide selection of local and international cuisine is available. Packed lunches are available on request as is a luggage transfer service. Car parking is also available on site. You will be warmly welcomed at Sycamore House with it's range of comfortable rooms to help you relax and enjoy your stay. There is also a self contained annexe if you would like to stay two or more days to explore the area. The annex is self catering with full cooking facilities. I look forward to greeting you.